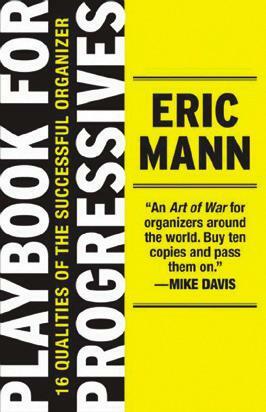 Eric Mann’s new book Playbook for Progressives is one of the most anticipated publications offered to the grassroots social justice movement in years. Over 10 years ago, a group of young organizers, including myself, surreptitiously got a hold of a four-page outline from a training that Eric had given at the Labor/Community Strategy Center in Los Angeles about the job description and the essential qualities of organizer effectiveness. The rough outline spread quickly, passed around to dozens of organizers, all seeking theory that spoke to the model of Left conscious organizing in the context of the U.S. From that point forward, we began our own campaign to urge Eric to write this very book. That one outline was so invaluable because we were always searching for theory and reflection on how to build grassroots mass organizations with Left edge and consciousness in the context of the US. Too many of our lessons and wisdom have largely been lost with our movement elders. While new generations are often inspired by the legacies that came before us, we often can’t find the organizations to join or the mentors to pass on lessons learned. From relative obscurity, we are then forced to chart our paths to power through trial and error. In my own experience as a young anti-racist white activist, I had many years of trial and error organizing—some really inspiring moments, and some serious crash and burn failures—before I was very fortunate to be trained at the Labor/Community Strategy Center National School for Strategic Organizing in 2001. 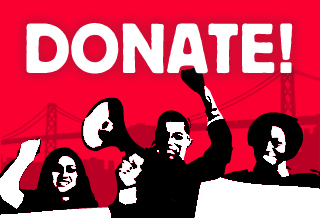 I spent the following nine years as a full-time organizer with POWER working to build a multi-racial, multi-lingual mass organization fighting for racial, economic, gender and environmental justice in San Francisco. For me, The Playbook for Progressives is the first book to really describe the model of organizing that I see as having the greatest potential to really transform conditions and build a movement for global justice inside the U.S. The Playbook for Progressives is exciting, because it takes political theory that is so sharp and helpful for mass organizing in the U.S. and makes it accessible to thousands of activists and organizers. Eric Mann is uniquely positioned to write a book on Left grassroots organizing, as he is one of the few long distance runners who has stayed directly on the frontlines building mass organizations and waging powerful campaigns in working class Black and Latino communities for over four decades. The book is filled with concrete examples from Eric’s own experience, as well as the lessons of his comrades and peers throughout his forty year history in the civil rights movement, labor movement and environmental justice movement in some of the most exciting and dynamic struggles of our time. Playbook for Progressives is a call to anyone who reads it to join the movement—not as individuals, but to be part of building a larger movement that can make history. It is a call to activists to join organizations and begin organizing in the place where you are. It is a manual designed to help strengthen grassroots organizations, and a call to begin coalescing our various arenas of work into a broad social movement for global justice. Jaron Browne is the Communications Director at POWER (People Organized to Win Employment Rights) in San Francisco. Jaron is also a co-author of Towards Land, Work, and Power. Before joining POWER, he did organizing and campaign research against racism in the criminal justice system with the Ella Baker Center for Human Rights. Jaron was trained as an organizer in Los Angeles at LCSC’s National School for Strategic Organizing.